I actually have listened to the audio version of this book, and I found it very well narrated and easy to understand. Dave Kraft has done a great job of reducing a lot of the "fluff" around leadership. Dave is certainly qualified to teach on this subject drawing from 3 decades of leadership in ministry, coaching hundreds or other leaders, and currently still serving as an Elder/Pastor in his 70's. This is a small but powerful book. Having listened all the way through, I decided to buy the eBook as well, so I can go back over it again at a slower rate to let the teachings settle in, as well as putting into practice what Dave is teaching. I would recommend it for anyone in any kind of Church leadership or anyone aspiring to leadership. Pastor Dave Kraft is in the right season of life to write this book. 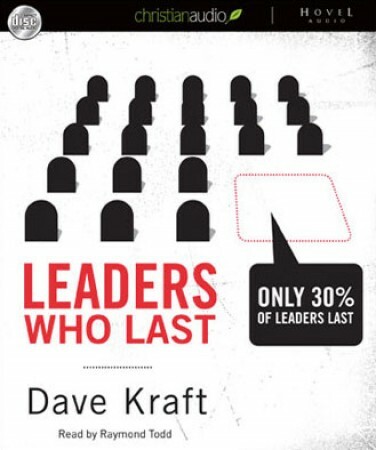 In short, Pastor Dave Kraft is one of the few leaders who last. He has helped me lead better and last longer. A few years back I was basically burned out in every way. The combination of the fast growth of our church, my lack of experience, and the immaturity of our organizational structures left me completely overextended. I was working out of my area of gifting, and it was literally breaking me, though I was only in my mid-thirties. My adrenal glands were fatigued. I could not sleep. I was seriously discouraged, exhausted, and frustrated. At that time God brought into my life a handful of ministry and business leaders who were older, wiser, and humble enough to serve me. Pastor Dave Kraft was one of those men. As a profes­sional ministry coach, he brought me through a formal coaching process and helped me get my life and ministry in better order. He gave me permission to make some very difficult decisions for the well-being of my family and our church. He wanted me to be one of the leaders who last. A few years later, I can easily say I am in the best season of my life. The weight of ministry has not changed, but by God’s grace, I keep changing. Now, I am glad to see a friend who served me well publish this book because we both want you to be one of the leaders who last. Sadly, too few Christian leaders finish well, and a combination of grace and wisdom cannot be overvalued. You will find both in this book. I am deeply grateful for the investment that Pastor Dave Kraft has made in me and a long list of other leaders in Mars Hill Church, the Acts 29 church planting network, as well as other denominations, networks, and companies. I am also deeply grateful for the partnership we have at the Resurgence to publish Re:Lit with our friends and gospel partners at Crossway, and I want to thank Dave for writing this book and Crossway for publishing it. It is simple, helpful, practical, read­able, and reliable.